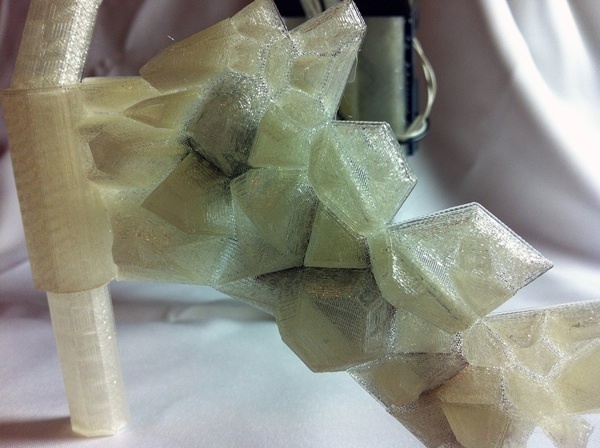 #3DxArt – Kristin Stransky: “STATEMENT” and “Personal Thoughts” #3DThursday #3DPrinting #3D « Adafruit Industries – Makers, hackers, artists, designers and engineers! Kristin Stransky: “STATEMENT” and “Personal Thoughts” . 3D printed and modeled necklace with polished and thermochromatic plastic. Embedded electronics. STATEMENT explores the nature of fashion and accessories: what they say about the wearer, the consciousness of the wearer of these statements, fashion protocol and the beauty process and preparation. When the wearer touches the main motif, the necklace makes a statement. Headpiece that pumps thoughts the user may or may not currently experience. The notion is to incur am emotional space that is more conducive to low self-esteem, second guessing and what it may be like to experience some forms of mental illness through the aid of a computer. At what point is the user an emotional robot, and can this state be triggered through the aid of a computer? Personal Thoughts is an attempt a cyborg-type lifestyle and the osmosis that can occur between machine and user with constant interaction between the two forms. The robot voice attempts to enter human space through inflection, and the user attempts to enter robotic space by wearing the piece and contributing their skin as a trigger.